THE folk at my new workplace have pointed out, maybe even pointedly pointed out, my ‘80s sensibilities. Clearly evident in my work wardrobe are prints and shapes from the era – hey what can I say, I’ve told you before I was 'Cyndi Lauper keen-as' for the ‘80s fashion revival and I’ve been working it to the max. There may not be another chance in this lifetime peoples … what are you waiting for. Are you hearing me PottyMouthMama? Are you? Anyhoot, as it turns out I am not the only person reliving the fashion victim moments of my youth. What Ken Be Done is too. If she wasn’t doing it for a good cause I’d seriously hold it against her that she clearly outbid me on eBay for these Ken Done sunglasses. What she doesn’t have is an original Helen Kaminski raffia hat. Ha. And it cost me a measly $4 at Salvos, not $165 (feelin' a tad guilty now I know that bit). Guilt aside, remember when these were everywhere? There were even craft workshops to make your own Kaminski knock-off - not that I ever tried to rip the ever-so-clever Kaminski off. OK, I think I’ll have to go dig out some ‘80s and '90s fashion love from the photo albums. Wanna play. I’ll post if you will. Leave a comment below and I’ll make a little sidebar of those of us brave enough to show off our fashion faux pas from 20-30 years ago. Steph, this one's for you. Now's the time to rock "ye olde prom dress". OMG! Did anyone have a mullet? Back with more … watch this space. I dug out a Ken Done relic the other day so I can send a pic to What Ken Be Done. True story. And I worked with Helen Kaminski's daughter in DJs (on the floor) many years ago. She was blonde and gorgeous. Because you needed to know that. Ok ok. I will embrace it. I won't fight it. ahh lovely! cyndi lauper was my idol, although i never did do the dress like her thing. I do remember a mullet in about grade 5 though..terrible...why did the hairdresser listen to me, I was just a kid!! Can't wait to see the pics! no photo's of my fashion misdemeanors sadly, as photo taking was not quite as ubiquitous as it is now...however, I do recall a matching pink tie dye t-shirt and sweatpants combo that I used to wear as an 'outfit' (with mirrored glasses and sneakers accessories). Admittedly I also owned a yellow version of this ensemble, but in my defense I was nine at the time. I also had my heart set on an electric blue dress with ruffled skirt for my grade 12 prom,which never quite materialised. It wouldn't have looked out of place today. oooh you didn't have a mullet did you? 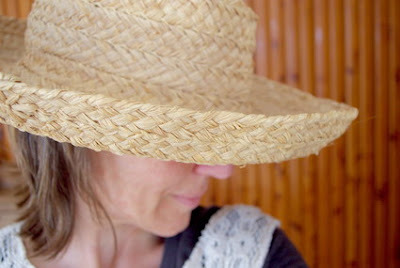 but you know i made one of those hats, my next-door neighbor did folk art classes and yes i was a victim of a few (shatter) anyway it took me all day to plait enough to make the hat and it was the most uncomfortable hat ever. Hello hello. Thanks for the link and words, katiecrackernuts! You are right, no on the Helen Kaminski front. Just for the record, that wasn't me who outbid you on the recent Ken Done glasses auction... I got mine ages ago from the UK. The one's recently on eBay went for so much $$ - gasp! - and it can prove a very expensive way of raising money for charity! Ooh yes. The best mullet in high school. Then it morphed into more of a mane than a mullet (think lion, not horse). With streaks, remember those? Where the hairdresser used some tool of torture like a fine metal crochet hook, stabbing your scalp again and again until you were almost bleeding, to extricate clumps of hair through tiny holes in a rubber cap. Ah yes, fashion is torture.